***Money Orders and Personal Checks are accepted for sales as well. Please contact us with your order directly for payemnt instructions. No sale is final until payments are received. 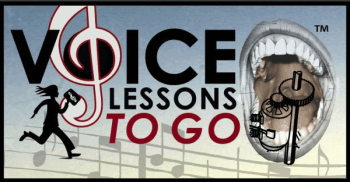 Voice Lessons To Go For Kids! *This can include what to work on, what type of music to sing, performance recommendations, etc. 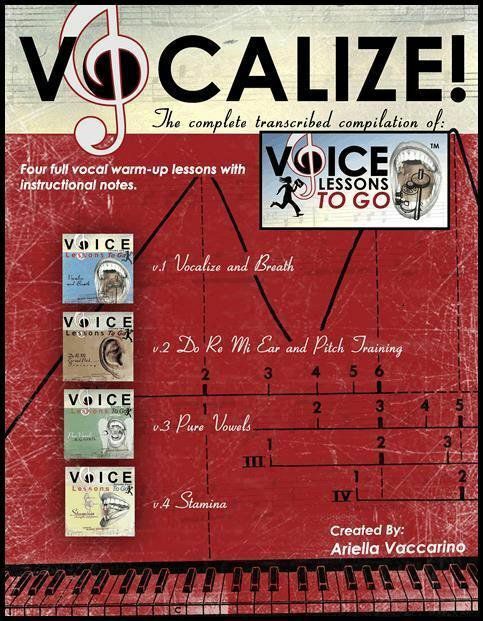 Designed as a companion to the Voice Lessons To Go™ CD series, VOCALIZE! is the transcribed compilation of the first four volumes. For singers, having the lessons in sheet music form really helps you to visualize each exercise. For vocal coaches, voice teachers, and choir directors VOCALIZE! provides an excellent resource to complement your lessons and develop a curriculum. The book contains sheet music for the lessons provided on each CD. 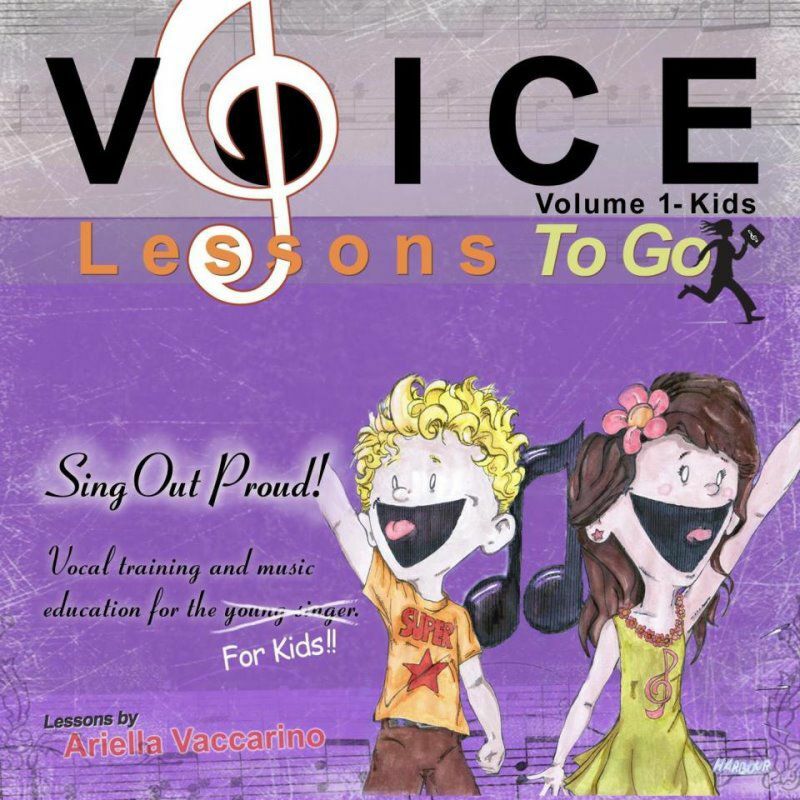 Each exercise includes individual notes of instruction by Voice Lessons To Go™ creator, Ariella Vaccarino. 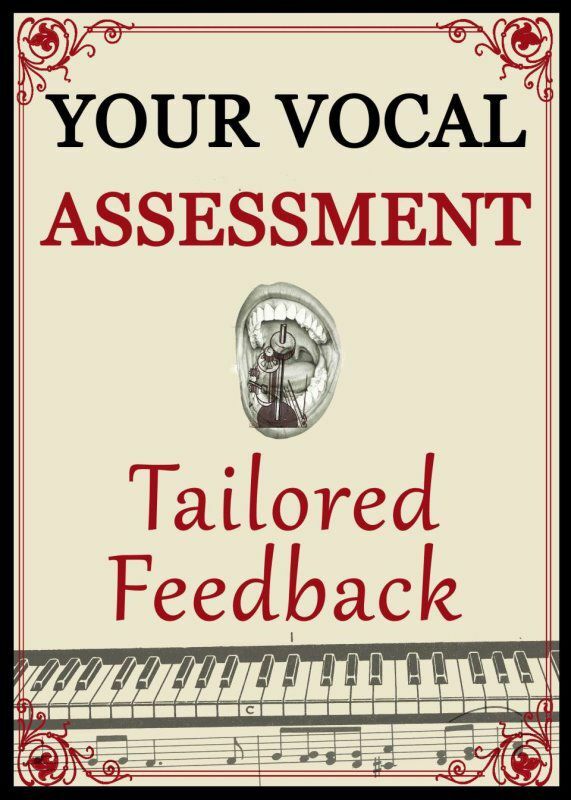 In addition to the range of vocal exercises – from simple to challenging – the beginning of the book provides advice on posture, breathing and finger break-downs for piano players. Children’s voices are joyous instruments. But, their voices are young and not yet fully developed. Proper singing instruction that is geared toward a child’s capabilities and guides them, in a healthy way, through good basic vocal warm-ups is essential in developing good singing habits that will not damage a child’s developing voice. V.1 – Sing out Proud! was designed specifically for the younger singer. It introduces kids to the world of singing and teaches them how to warm up their voices in a healthy, fun way. 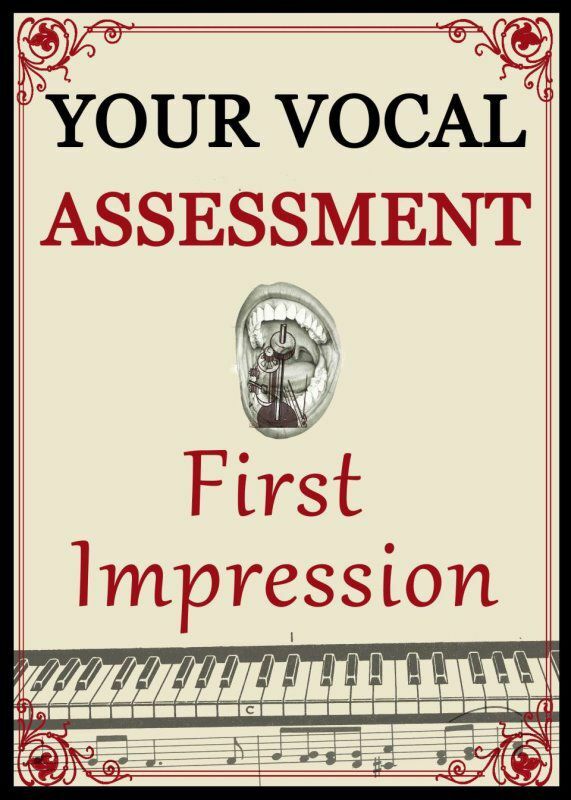 With gentler vocal ranges, the exercises are easy to follow, easy to do, and easy on the voice. And it is an excellent way to provide kids with the number one quality needed as a performer – confidence! This first volume in the “For Kids” series contains tips on healthy singing, including correct posture, breathing and diction as well as singing warm-ups broken up into three separate vocalizes: singing numbers (1, 2, 3), singing syllables (la), and singing solfege (do, re, mi) . Musical terms such as “major scales”, “chords”, “octaves”, “staccato” and “legato” are sung and explained throughout. Developed for children ages 4 – 10+, the goal of Sing Out Proud! is to build healthy, confident voices and provide an introduction to music education – creating good singers on the road to becoming young musicians. Great supplement for schools that no longer provide music education, or as an arts education resource for homeschooling. Learning to sing is about much more than singing a song. Proper warm-ups, breathing, and posture are vital to achieving your singing goals while keeping your voice healthy. Daily vocal warm-ups, known as vocalizes, can enhance your breathing, improve the quality of sound you produce, and help you strengthen and extend your vocal range. 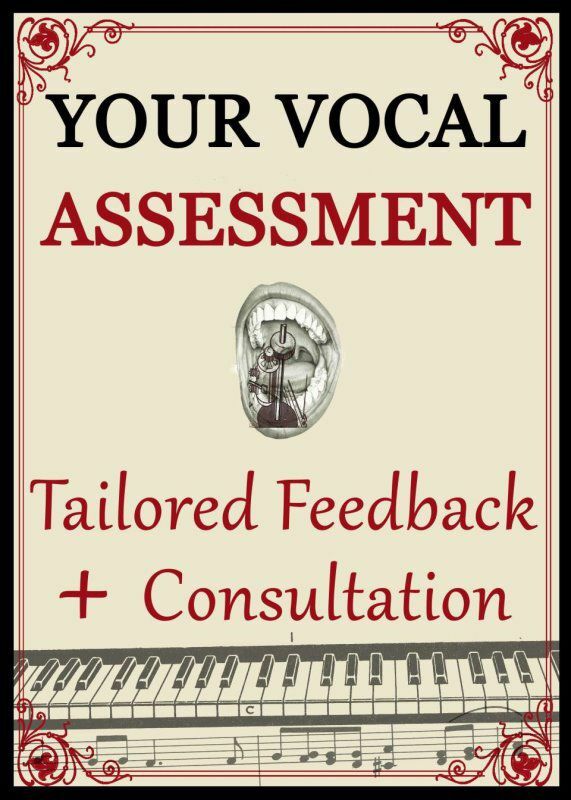 V.1 - Vocalize & Breath provides a thorough voice lesson consisting of a half hour of vocal warms-ups followed by breathing exercises and advice on posture and training. 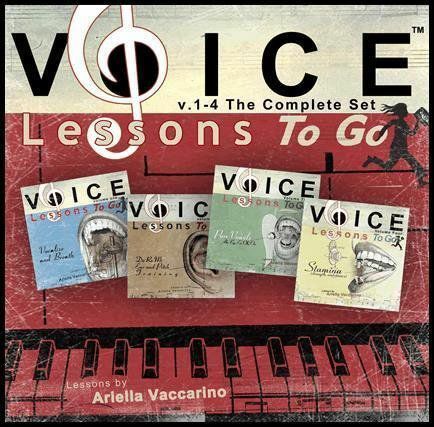 Ariella Vaccarino, creator of Voice Lessons To Go™, guides you through the singing exercises, providing vocal examples to piano accompaniment. 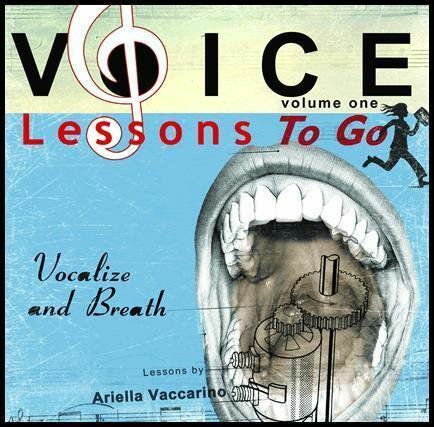 For beginning singers, Vocalize & Breath is a great introduction and exposes those with little vocal training to the rudiments of singing instruction. The exercises are simple with less demanding ranges, easing you into voice training. And Ariella gives explanations of each vocalize that are clear and easy-to-follow. For professionals and more seasoned singers, Vocalize & Breath is the perfect daily warm-up to gradually wake up your vocal instrument; engaging your diaphragmatic muscles through proper breathing, creating a strong support system which allows you to sound and feel better during and after a performance. 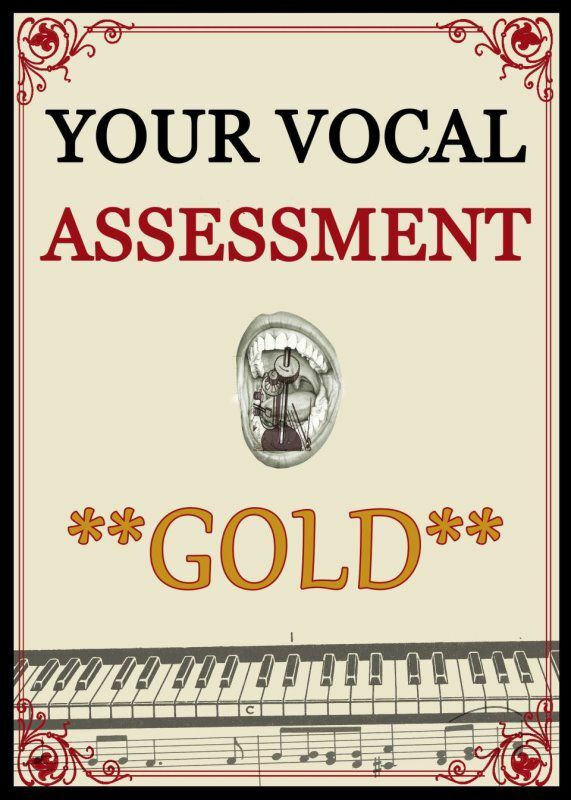 Because the vocal ranges are less demanding, it is a great for vocalizing before rigorous singing. Ear training is the process of understanding music and sound – the connection between notes, intervals, chords, etc. with what we hear. Because there is a direct connection between hearing correctly and singing accurately, ear training is vital to learning to sing. Solfege, or Do, Re, Mi (like the song from Sound of Music), is one of the most critical musical skills for training the ear. It is the universal language of music that helps develop relative pitch and teaches sight-singing (the ability to sing a melody just by looking at the notes, or knowing the notes just by hearing the tune). 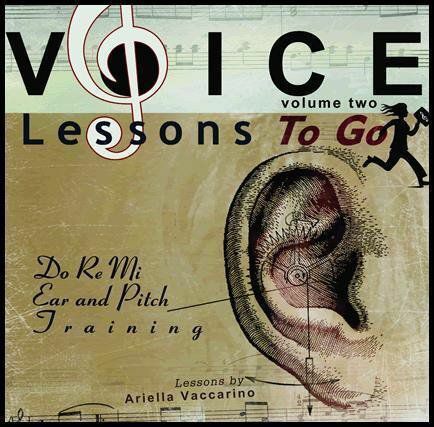 V.2 - Do Re Mi / Ear & Pitch Training focuses on improving your musicianship and sense of pitch. Filled with vocal exercises using solfege (Do, Re Mi), it is great for training your ear as well as strengthening your voice. The CD starts off with simple tone recognition, then moves on to solfege – concentrating on singing through exercises based on forms of the major and chromatic scales, and ends with “Hearing Your Note” which teaches you how to pick out and sing specific notes of a group. For beginning singers, Do Re Mi / Ear & Pitch Training is the key to really understanding music. It provides university-level musicianship education that most singing teachers don’t teach – developing your ability to recognize intervals without looking at the piano or music. For professionals and more seasoned singers, Do Re Mi / Ear & Pitch Training is a good “refresher course” for the fundamentals of solfege and keeping your ear in shape. In addition to refining musicianship skills – intonation, note interval, aural skills– the CD is a great alternative warm-up pattern focused on ear training.